Everyone seems to be talking about them. So much so, that the more you hear about them the more you begin to think that you MUST have some sort of hormone “problem”. Leptin is the king when it comes to fat loss. But the truth is, it goes WAY beyond hormone production or the absolute amount of a hormone that’s released. Sure, if you’re suffering from a hormone-related symptoms, it could be that levels are “too high” or “too low”. But it might not be. In this paper something called glucocorticoid receptor resistance was discussed. This was essentially saying that it’s probably not so much the release of cortisol in stressful times that’s the problem per se, but rather that cells were resistant to cortisol. In the same way that a cell is resistant to insulin in a type 2 diabetic. Or when we have resistance to any other hormone: the receptors aren’t working properly. 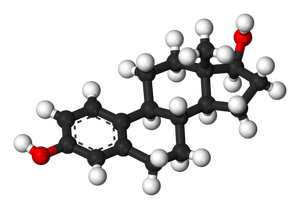 Hormones are essentially signalling to cells to carry out a job. For example, the presence on insulin in the bloodstream signals to the cell to bring glucose transporters to the surface of the cell and allow glucose to be brought in from the bloodstream into the cell. The result? Blood sugar drops back down, i.e. 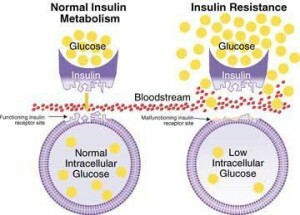 the exact role insulin was released to do. How do cells signal to the cell to do something though? The signal is sent when receptors on the surface of the cell detect the presence of the hormone and they bind. This formation of a “hormone-receptor complex” lets the cell know it’s time to rock and roll. ]In the above video I use the analogy of someone sending instructions for a job to somebody else. In a normal situation, person A will dial person B’s number, person B’s phone will ring, they answer, hear the instructions and then carry out the job. And that’s how hormone signalling to cells should work. But take a second situation; same scenario as before except this time person B’s phone doesn’t work. So what happens? Well person A still needs the job done so still dials the number. Person B is still there with their phone waiting on the instructions. But what they don’t know is that the phone isn’t working. As the phone doesn’t ring, they don’t get the instructions and so don’t perform the task. And that’s essentially hormone resistance. A gland (person A) will still secrete the hormone (dial the number). The cell (person B) still has receptors (their phone) to the hormone and is waiting to receive a signal (a call) to start doing something. But the receptor (phone) is “broken” or dysfunctional and so the cell doesn’t get the signal (call) no matter how much of the hormone is pumped out (how many calls are made). So as we see, it’s not necessarily the hormones that are the problem. Secretion of insulin/cortisol/etc. is a normal process that we actually need our bodies to undertake. We should be able to have these hormones go up and down and be perfectly fine. I repeat, should be. The issues arise when we become resistant to a hormone, not merely from a hormone being present per se. How do we become resistant? That’s a complex topic for another day but in a lot of cases it’s simply when we constantly produce high levels of the hormone. The receptors down-regulate or “burn-out” due to the constantly elevated hormone levels. In our analogy this would be equivalent to constantly having the phone in use without a break. What happens? Battery goes dead and it stops working. Sometime you can charge it backup but sometimes it’s done for good. Let’s leave all that good stuff for another post though!